On this day in Tudor history, at Richmond Palace, sixty-nine-year-old Queen Elizabeth I, the only daughter of Henry VIII and Anne Boleyn, “departed from this life, mildly like a lamb”. She had ruled for over forty-four years, since 17th November 1558, and her reign has gone down in history as a “Golden Age”. You can find my “on this day in Tudor history” video below, about Elizabeth I’s death, but if you prefer reading articles then you can click here to read a primary source account of her last hours. RIP Gloriana, Good Queen Bess, the Virgin Queen, Elizabeth I.
P.S. People have been asking me on YouTube about my Elizabeth I t-shirt and how to buy it. You can find it here. « Did Anne Boleyn get sweating sickness? A sad day indeed. Elizabeth was certainly a nice way to end the Tudor dynasty. Elizabeth I combined the savvy public relations and stringent accounting skills of her grandfather and her great-grandmother with that special quick wit of her mother. She had the heart of a lion and nerves of titanium. 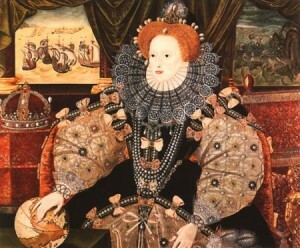 For decades I have thought that Elizabeth I created the British Empire and Elizabeth II let it collapse. Different times, of course, but has it got anything to do with their characters? Just how did Elizabeth ii let the British Empire collapse? Elizabeth ii wasn’t even on the throne when the majority of the Empire collapsed. India won independence in 1947 and much of the Empire had already began to go before her reign. Others have left in the 1970s but much before this, not that the Queen had much say or power to stop it collapsing. Good on every single country throwing out the colonial masters of Britain, Spain, Portugal and the Dutch. What right did Elizabeth I or King Philip or anyone else afterwards have to march in and steal the lands of other people? O.K yes, it wasn’t that simple, trade and discovery played a part, rights were signed away via treaty, the Pope and the local rulers and in some instances we were invited, but mostly it was war and force and slavery. Elizabeth I didn’t exactly found the British Empire, in fact she had very little to do with it, but the first contacts made during the reigns of all of the Tudors and the expansion of those colonial plantings helped make the foundations. The problem with having a vast Empire on which the sun literally doesn’t set built up over 200 years, is that eventually you can no longer afford to keep it and to ensure the people are prosperous. Eventually you rule like a tyrant in order to maintain control and the vast political and social and economic problems which may be good for a time, take a huge toll on the ordinary people. We tried to force “Englishness” on the native people, ignoring their customs and rights and they did what every oppressed race does, rose up and threw us out and good on them. And what about the burden here? The industrial revolution and expanding the Empire were linked as were the terrible social conditions and poverty, disease and overcrowding most people working in those industries suffered. The industrial revolution collapsed as well as the Empire and unemployment became widespread. I am sorry for the lecture, but while the colonial contact saw a number of positive things, the vast expansion which led to the British Empire has very little to commend it. I commented on the You Tube so I will keep my post to a minimum, Elizabeth 1st is a national icon to the English, rather like William Shakespeare, fish and chips and cream teas, all schoolchildren have been taught about the Spanish Armarda and Good Queen Bess, there have been films and novels about her and she embodies the fight against tyranny, the stand against the evils of the inquisition, colourful and larger than life like her father, she is a fascinating person to study as she was complex and could be very cruel, yet very kind and her public adored her, her traumatic early life modelled her into the person she later became and made her wary and cautious, the nation mourned deeply when she died and it was said there had never been such an outpouring of grief till then, her death also meant the death of the Tudor dynasty and gave way to the Stuart’s, and the forging of Great Britain. A woman and especially one who was bound to be surrounded by enemies as she was contrary to the norm expected and to the world around her, living to be 45 was an achievement, let alone ruling for 45 years. Elizabeth I is a myth, but a myth that she controlled, as her father did. As cruel and as ruthless as the rest of the Dynasty, yet a much more astutely aware and able politician, Elizabeth has gone down in history almost as the saviour of the country, which was by mere luck than anything else, but true nonetheless. She turned herself into an immortal goddess, she controlled her image and projected the idea of Glorianna into the historic mind through her portraits, which are magnificent. Her subjects had no idea that by the time of the Amarda the Queen was losing her teeth, wore red wigs, hid her face because she was terribly marked by the smallpox and had wrinkles. Few outside of her inner private sanctuary saw her this way without her thick layers of paint or knew she took three hours to dress. The image which emerged into the throne room every day was one of magnificent splendour and flawless beauty, golden hair and wearing fabulous fabrics and pearls. Her insecurities were also kept carefully under control. Yet, during most of this period she had been in denial, hidden from sight until it was all over then she emerged again, this time like some beautiful angelic vision of deliverance, a warrior on a white horse to deliver her famous speech to her waiting soldiers, who were actually no longer needed. Not that it mattered, it was the show which mattered and the speech did the trick. That was her thing, something she had learned from her father and sister. Elizabeth was no myth, she was a woman who achieved the greatest prize despite the obstacles and life events which appeared to make her succession impossible. She faced down those who wanted to stop her and she triumphed. Her reign has much to commend it, but I don’t believe any King or Queen ruled over a Golden Age and Elizabeth was no different. The age saw many positive things and growth, in the arts, becoming famous mostly because of the Bard, but there were many others who contributed to the blossoming of the theatre, the expansion in exploration and state sponsored piracy filled the treasury with much needed funds, the defeat of Spain and the expansion of many trades helped to pave the way for a better economy. Education flourished, but Catholics were denied admission to many Universities and had to attend C of E grammar schools, which although they offered an excellent education, denied them religious teaching, so numerous people sent their children abroad. Portrait painting flourished and book decorating and the wool trades were all viable. The Elizabethan Poor Law laid the foundations of state aid to the poor right up to the twentieth century as the Victorian Poor Law followed many of its principles, at least in theory. Poor Laws had been passed before, there was one in 1563 but they were never as well structured or far reaching. However, Elizabeth inherited a paranoid crown and she and her government were completely suspicious of anything which didn’t fit their new normal. Plays and books were heavily censored, because they were heavily critical. Elizabeth was Excommunicated because of her heavy fines and a hardening attitude in Rome. Believe it or not she actually had a good relationship with the Pope before 1570 and Pious Iv wrote to Elizabeth cordially. His successor, Pious V was much stronger in his defence of orthodoxy in the face of the rise of the Reformation and he declared Elizabeth a heretic and issued a Bull of Excommunication, which was trouble for her English subjects who were now released from their allegiance. Her imprisonment of Mary Queen of Scots and ruthless handling of the popular and dangerous Northern Risings, left him with little choice. However, it also put an unwelcome spotlight on and heavy burden on English Catholics. As a result the laws against Catholics were tightened like a noose and the persecution followed. Elizabeth thought her religious settlement would be acceptable to everyone but in all honesty it never could be and fines were already lining the Government pockets as people from traditional families stayed away from their parish church. However, it was in theory possible for many to attend once or twice and hear Mass at home. Now that too became impossible because the education of Catholic boys led to them leaving and training as Priests in Rome, Rheims and other English Colleges abroad. It was this batch of young men who would return in the 1580s and risk their lives in the effort to reconcile people to the Catholic Church in secret and to administer the Sacraments to Catholics in England. By then the paranoid mix of Francis Walshingham and William Cecil were running their spy ring and pursuivants to hunt down Catholic priests, hidden in homes and anyone who sheltered or helped them. The penalty was hanging, drawing and quartering, and it was made high treason. A few mad gentlemen decided from time to time to do something about the situation and conspiracy after conspiracy followed to release Mary Queen of Scots and to kill Elizabeth, but the majority of Catholics were loyal and were innocent of treason. They were executed for religious reasons. Another negative thing which is often forgotten is that Elizabeth was determined to enforce English rule in Ireland. This was a complete disaster. Lord Lieutenant after Lord Lieutenant came out with an English army, got stuck in the Irish bog and ended up being recalled. The Earl of Essex in particular found Ireland challenging and was left with little support, senseless demands to attack Tyrone, who was well protected and who made a truce with him, which was not popular with Queen Elizabeth and led to his downfall. Her wars were too expensive and the end of her reign saw diseases, famine and crop failures and people demanding peace. However, it didn’t stop them from mourning her and remembered her mostly for her positive achievements and thus the legendary status of this remarkable lady was born. RIP Queen Elizabeth I (1533 to 1603) Regnal Years (1558 to 1603) however you are remembered, may you find peace. Amen. Did enjoy reading your synopsis, BQ. Thanks! Ah, thanks, Globerose, very kind of you. Cheers.